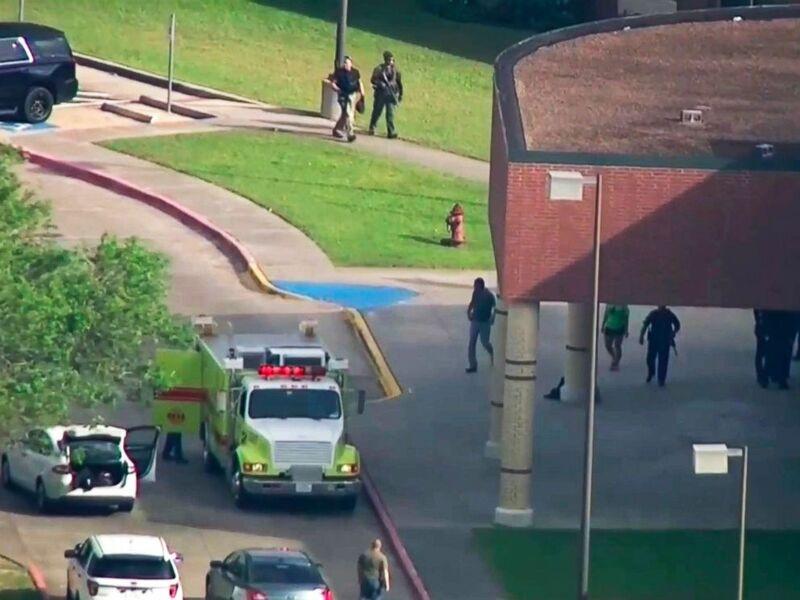 At least 10 people are dead after a 17-year-old student allegedly opened fire at Santa Fe High School in Texas this morning, sending students fleeing for their lives, the governor said. Interested in Santa Fe School Shooting? Add Santa Fe School Shooting as an interest to stay up to date on the latest Santa Fe School Shooting news, video, and analysis from ABC News. Ten others were wounded, including a police officer who is in critical condition, officials said. 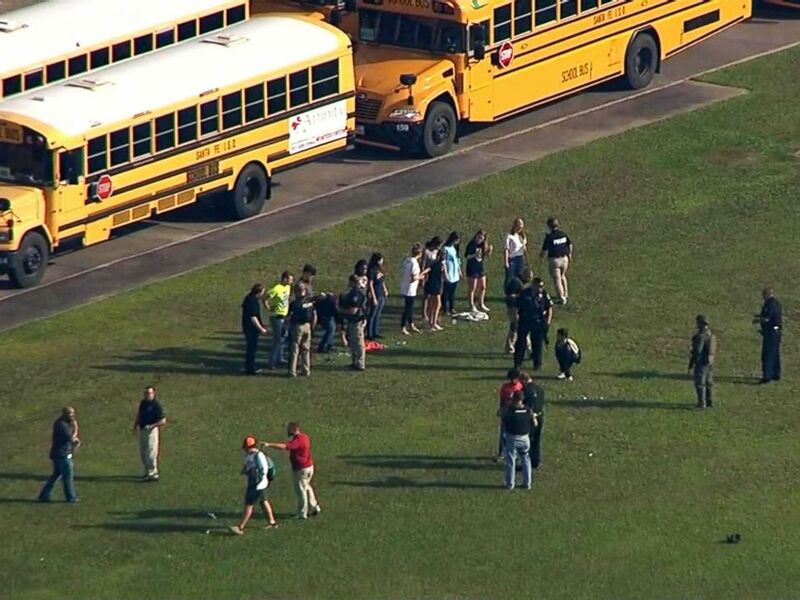 A teacher is among the dead, according to law enforcement officials. Gov. Greg Abbott called the shooting "one of the most heinous attacks that we've ever seen in the history of Texas schools." 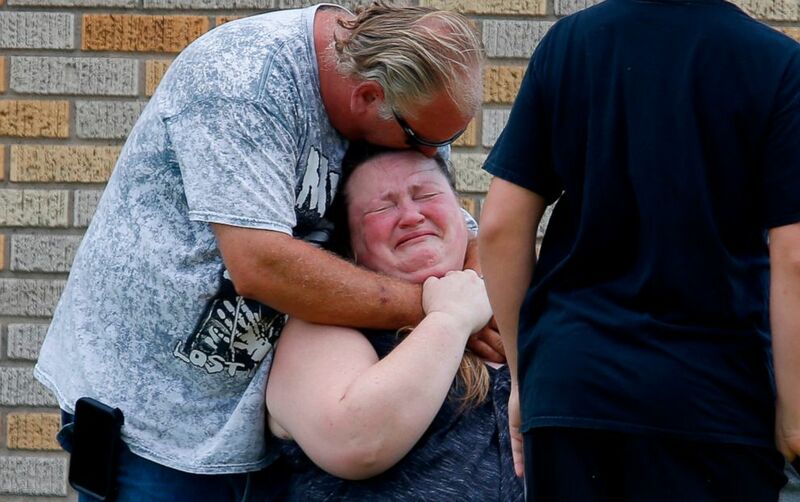 A man hugs a woman outside the Alamo Gym where parents wait to reunite with their children following a shooting at Santa Fe High School in Santa Fe, Texas, May 18, 2018. 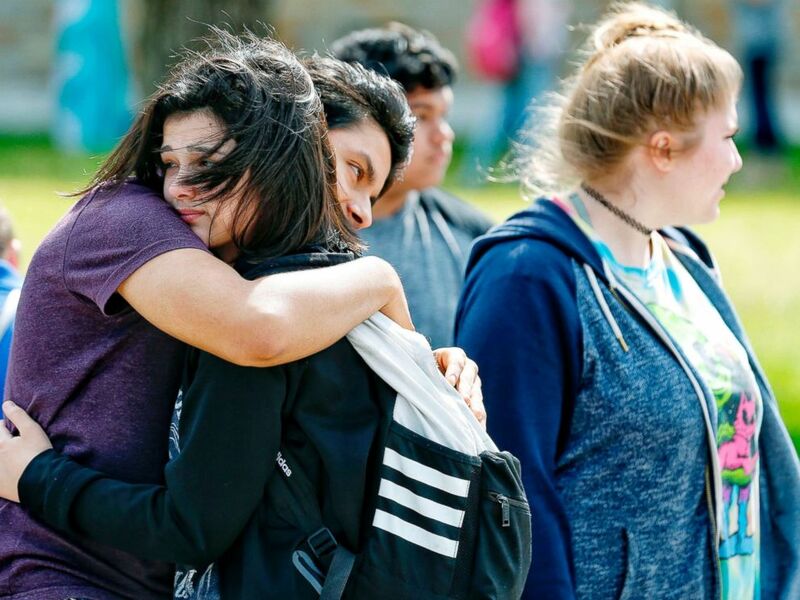 Santa Fe High School freshman Caitlyn Girouard, center, hugs her friend outside the Alamo Gym where students and parents wait to reunite following a shooting at Santa Fe High School, May 18, 2018, in Santa Fe, Texas. The suspect, 17-year-old Dimitrios Pagourtzis, is in custody and has been charged with capital murder, officials said. 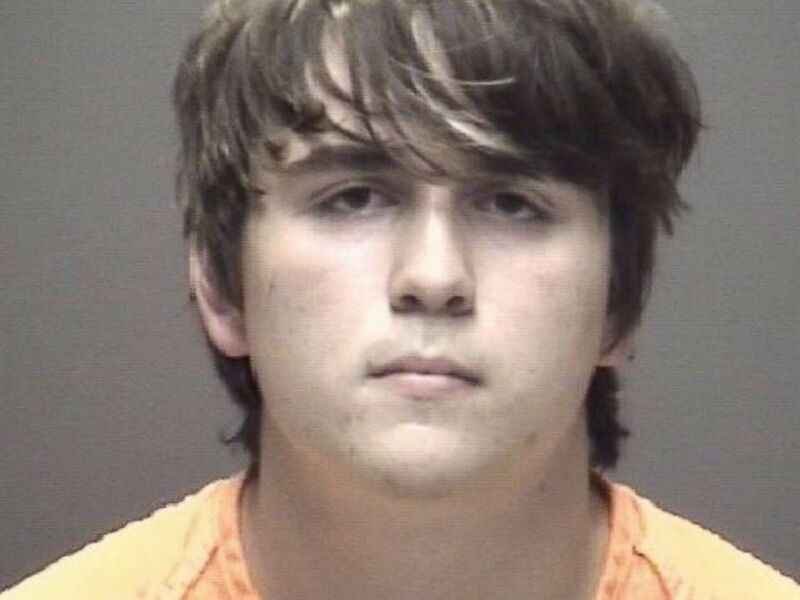 The suspect allegedly wrote in journals that he wanted to carry out the shooting and then commit suicide, but he gave himself up to authorities, according to Abbott. At the Santa Fe Police Department, Pagourtzis gave a statement admitting to shooting multiple people inside the school with the intent of killing people, according to an probable cause affidavit. Pagourtzis also allegedly stated during the interview that he did not shoot students he liked "so he could have his story told," the affidavit states. There were no warning signs and the suspect doesn't have a criminal history, officials said. Dimitrios Pagourtzis, 17, is the suspect in a deadly shooting at Santa Fe High School in Texas, May 18, 2018. A second individual, a person of interest, has been detained, officials said. Two weapons were used in the massacre -- a shotgun and a .38 revolver -- both of which appear to be legally owned by the suspect's father, the governor said. "I have no information if the father was aware the son had taken these weapons from the father," Abbott added. Explosive devices were also found at the school, and devices including a Molotov cocktail were found in a car and a home, authorities said. 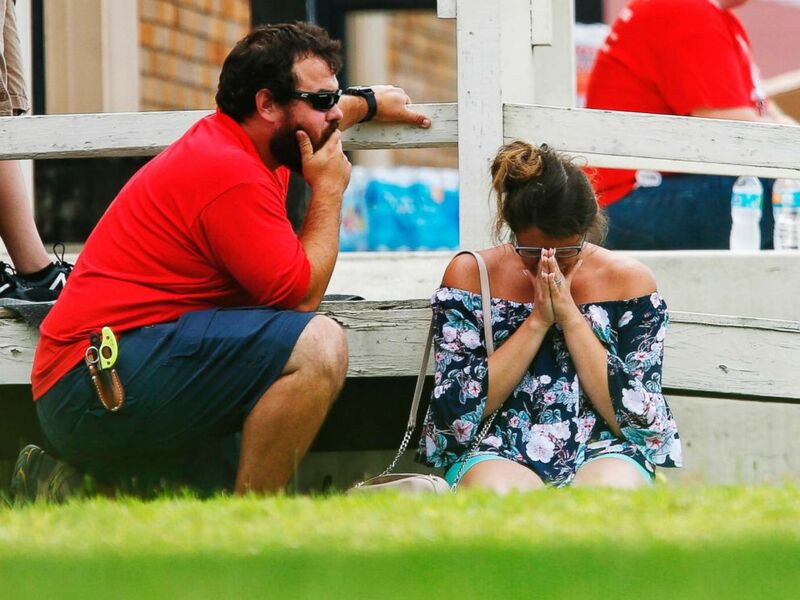 Students gather by the Barnett Intermediate School where parents are gathering to pick up their children following a shooting at Santa Fe High School, May 18, 2018, in Santa Fe, Texas. Freshman Peter Matuza was in art class this morning when he heard two explosions and ducked under a table, he said. The gunman shot Peter’s friend with a shotgun before turning and opening fire with a revolver, Peter told ABC News. Students were running and screaming and one student flipped a table over for cover, Peter said. Peter said he made eye contact with the suspect, noting, "he had a face of rage." "He could have killed me right there," he said. The gunman then “walked through a closet that went straight to the adjacent art room and began opening fire in there, as well,” Peter said. A woman prays in the grass outside the Alamo Gym where parents wait to reunite with their kids following a shooting at Santa Fe High School, May 18, 2018, in Santa Fe, Texas. Bryton Sumbles, a former football player for the school, told ABC News that he reported Pagourtzis to teachers in the past because he thought it was odd that he would wear trench coats in 97-degree weather, and he thought it would be easy to hide a gun under the coat. Nothing seemed to come from the report, Sumbles said. Another former football player, Zefe Nunez, said he remembers Pagourtzis as being incredibly quiet and that he wouldn't talk to anyone. Nunez was in the first classroom that Pagourtzis allegedly fired on, and he flipped a desk to shelter himself and a classmate as glass shattered around him. Nunez said he ran away while Pagourtzis was allegedly reloading, adding that he was wearing the same black trench coat he would always wear. 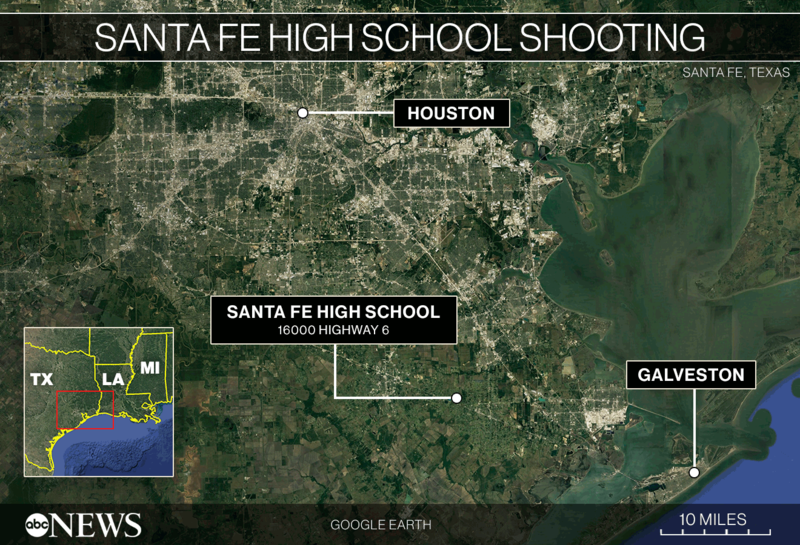 Law enforcement officers are responding to Santa Fe High School following a shooting incident in Santa Fe, Texas. A shooting was reported at Santa Fe High School, May 18, 2018, in Santa Fe, Texas. Among the injured is school district police officer John Barnes, who is in critical condition. Barnes, a retired Houston police officer, was shot in the arm and suffered major bleeding, hospital officials said. Two school district officers on campus were able to confront the shooter early on, authorities said. 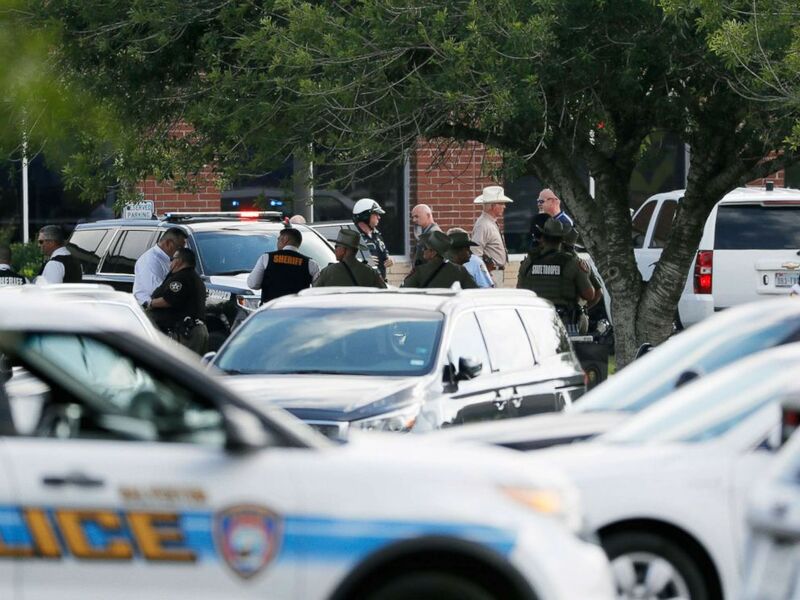 As students lined up outside the building, ambulances, helicopters and federal agents swarmed the school in Santa Fe, between Galveston and Houston. Cameras in the school are expected to provide a lot of information, said officials. A shooting took place at Santa Fe High School in Texas, May 18, 2018. 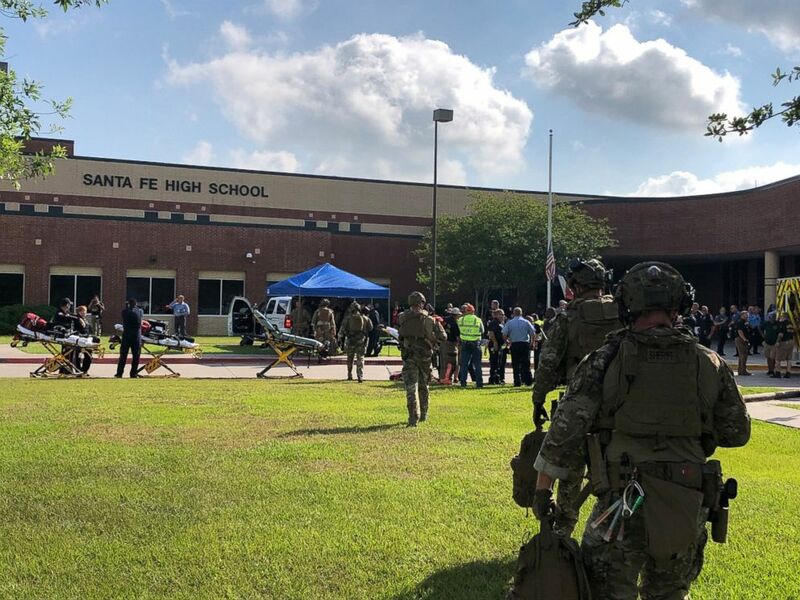 Emergency responders from multiple agencies work at the scene in front of Santa Fe High School in response to a shooting, May 18, 2018, in Santa Fe, Texas. "I’m scared to even go back," said one student, crying. "It’s just not something that you should feel throughout the day, being scared. Especially somewhere where we say the Pledge of Allegiance." 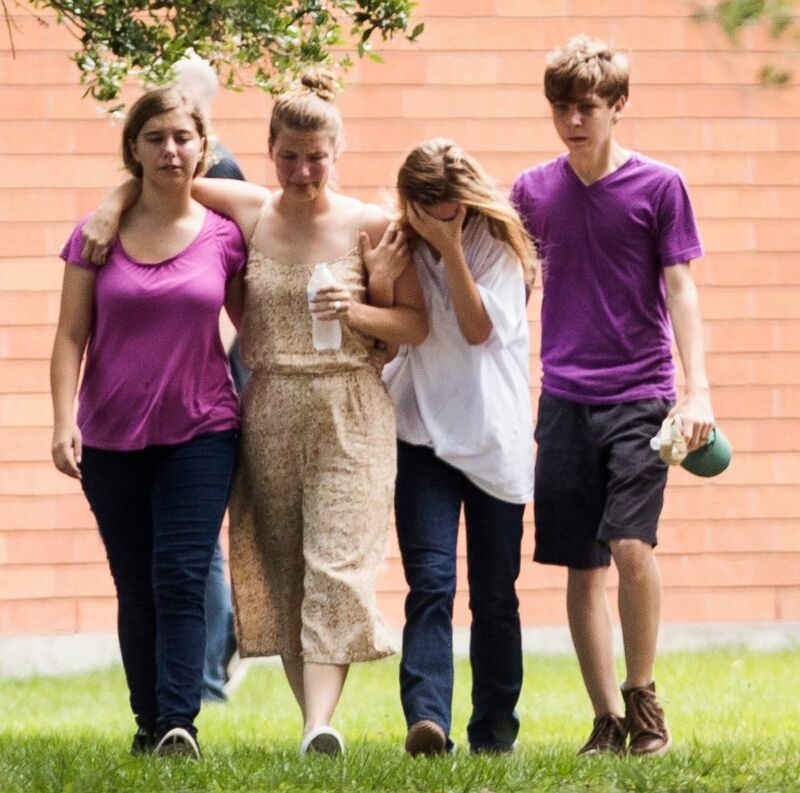 Santa Fe High School students leave the school after a reported shooting, May 18, 2018 in Santa Fe, Texas. This is the sixth fatal shooting at a school since the Parkland, Florida, high school shooting that killed 17 students and staff in February. The Parkland massacre prompted a national debate about gun reform and school safety. 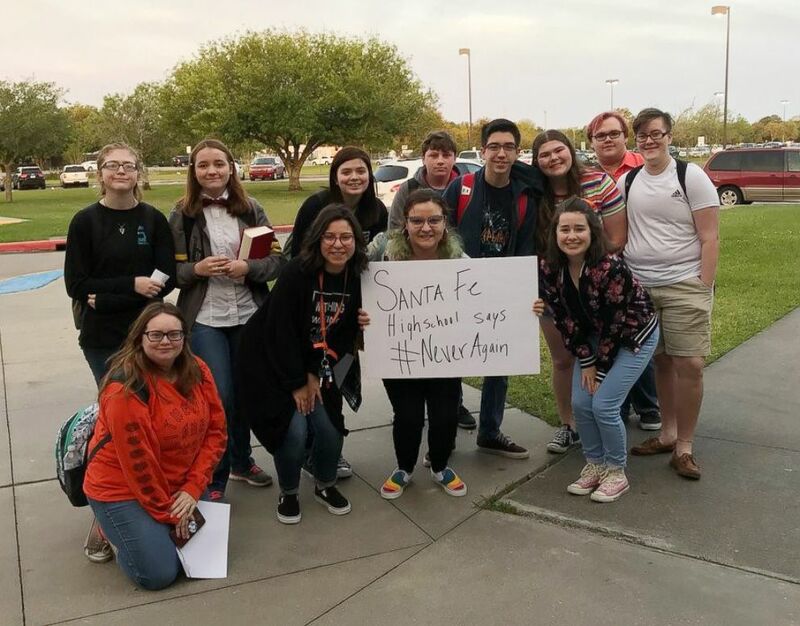 Just last month students at Santa Fe High School participated in a nationwide school walkout against school gun violence. The walkout was held on April 20 -- the anniversary of the 1999 Columbine High School massacre that killed 13. A Santa Fe student said they read poems by a Parkland survivor, held 17 minutes of silence in honor of the 17 people killed in Parkland, and discussed ways they could raise gun violence awareness and make their voices heard. Students at Santa Fe High School participated in a nationwide school walkout against school gun violence, April 20, 2018. School shootings have "been going on too long in our country," President Trump said today from the White House. "Too many years, too many decades now, we grieve for the terrible loss of life and send our support and love to everyone affected by this absolutely horrific attack," he said. Abbott said it's time to "make sure this tragedy is never repeated ever again." 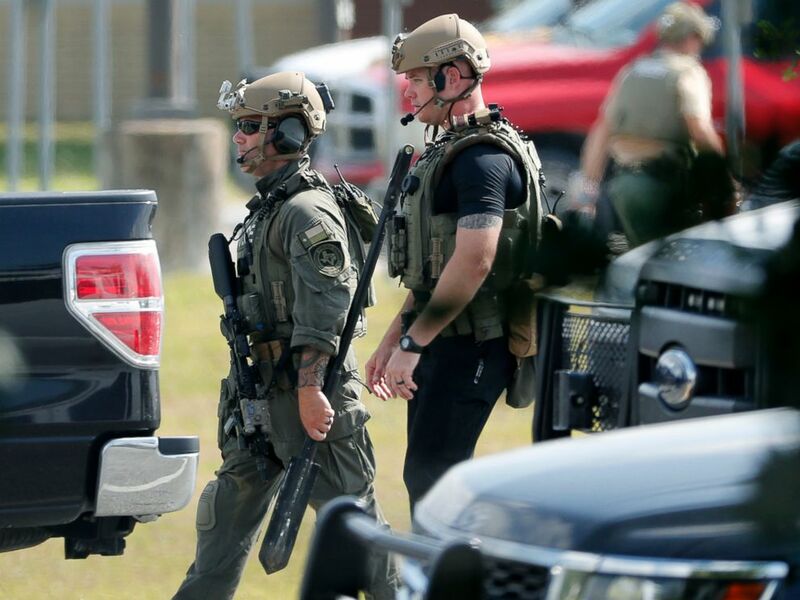 Police officers in tactical gear move through the scene at Santa Fe High School after a shooting on May 18, 2018, in Santa Fe, Texas. He said roundtable discussions with parents, students and educators will be held. "We want to hear from everybody who has an interest in what has happened today so we can work together on putting together laws that will protect second amendment rights but at the same time ensure that our communities and especially our schools are safer places," Abbott said. “We simply cannot allow this trend to continue,” she said. “Every day, the Federal Commission on School Safety is working to identify proven ways to prevent violence and keep our students safe at school. Our work remains urgent. Our nation must come together and address the underlying issues that lead to such tragic and senseless loss of life." Trump has ordered flags to fly at half-staff in memory of the victims. ABC News' Gina Sunseri, Jack Date, Aaron Katersky, Marcus Moore, Jim Scholz, Jennifer Watts, Jonah Lustig, Alyssa Pone, Meghan Keneally, Zunaira Zaki, Laura Coburn and Cho Park contributed to this report.